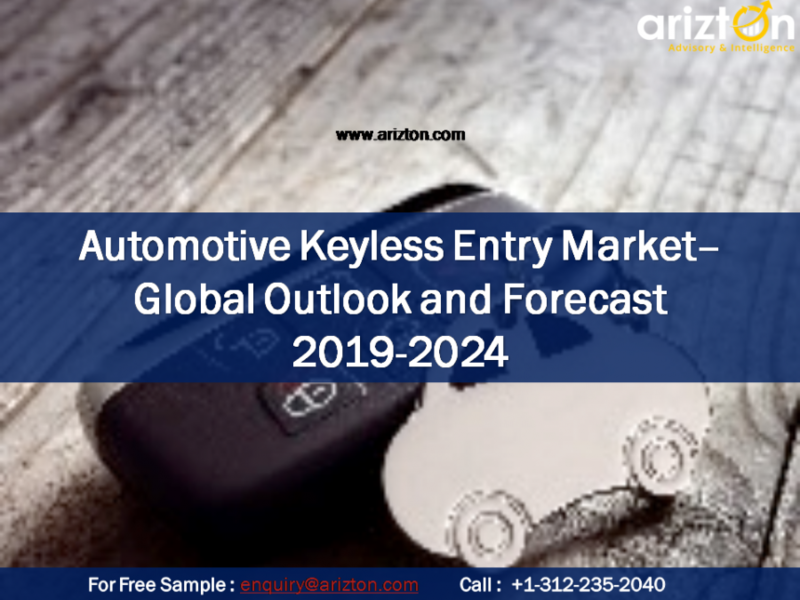 CHICAGO, IL, UNITED STATES, April 10, 2019 /EINPresswire.com/ -- According to Arizton’s recent research report, the global automotive keyless entry system market is expected to produce around 180 million units by 2024, growing at a CAGR of approximately 8% during 2018−2024. 1. Cloud-based keyless entry systems are expected to overtake PKE systems in next 5–6 years. 2. Europe and North America are leading the keyless entry system market; however, the next growth spurt is likely to come from the APAC region, which is expected to offer growth opportunities of more than 16 million units to vendors. 3. The increasing growth of luxury car market - which is more than 11% during the period 2018-2024 – is expected to have a positive effect on the keyless entry market in next five years. 4. The increase in the car thefts is a key driver for the adoption of keyless entry systems – the average vehicle theft rate worldwide stood at 105 during the period 2003–2016. 5. The increasing IoT integration in the automotive sector will emerge as a game-changer by 2024. The demand for keyless entry systems to grow 1.5 times in the next five years. 6. PKE systems are expected to witness more than 95% incremental growth in the next five years due to the increasing demand from emerging economies. •	Market Segmentation –A detailed analysis by product types, end-user types, vehicle types, and geographies. •	Competitive Landscape – Profile of 5 key vendors and 18 prominent players. Request your free sample today! This market research report includes detailed segmentations of the market by product types, end-user types, vehicle types, and geography. 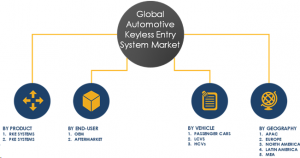 •	The remote keyless entry system (RKE) segment dominated the automotive keyless entry system market in 2018, and is expected to grow at a CAGR of over 6% by 2024. •	The passenger car segment is the largest market for keyless entry system, occupying more than 80% of the total market share. Convenience, safety, and ease of usage are the most important benefits offered by keyless entry systemsto end-users. The adoption of keyless entry system is growing in the low- and mid-segment vehicles due to the reduced cost and easy availability in the both OE and aftermarket. North America dominated the global automotive keyless entry system market. With the increasing popularity of keyless entry systems, developed markets such as Japan, the US, and Western European countries; and the growing demand from emerging countries will further drive the market during the forecast period. For more information, Order a report. Other prominent vendors include Advanced Keys, Alps Electric, Bosch, Calsonic Kansei, Denso, Directed Electronics, Hyundai Mobis, Lear Corp., Marquardt, Microchip Technology (Atmel), Mitsubishi Electric, OMRON Automotive Electronics, Panasonic, Tokai Rika, Voxx International, Silicon Laboratories, Schaffner Holding, and Automotive Data Solutions. Arizton – Advisory and Intelligence is an innovation and quality-driven firm, which offers cutting-edge research solutions to clients across the world. We excel in providing comprehensive market intelligence reports and advisory and consulting services. Arizton has gained a paramount standpoint in the market research arena as it offers top of the line solutions to clients to assess market landscape and to finalize foolproof business strategies. We are committed to provide inclusive market research reports and consulting services to clients from diversified industries including –Consumer Goods & Retail Technology, Automotive and Mobility, Smart Tech, Healthcare and Lifesciences, Industrial Machinery, Chemicals and Materials, IT and Media, Logistics and Packaging Arizton comprises a team of exuberant and well-experienced analysts who have mastered in generating incisive reports. Our specialist analysts possess exemplary skills in market research. We train our team in advanced research practices, techniques, and ethics to outperform in fabricating impregnable research reports.